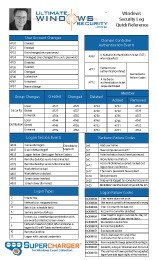 This is a useful event because it documents each and every failed attempt to logon to the local computer regardless of logon type, location of the user or type of account. Identifies the account that requested the logon - NOT the user who just attempted logged on. Subject is usually Null or one of the Service principals and not usually useful information. See New Logon for who just logged on to the system. Security ID: The SID of the account that attempted to logon. This blank or NULL SID if a valid account was not identified - such as where the username specified does not correspond to a valid account logon name. Workstation Name: The computer name of the computer where the user is physically present in most cases unless this logon was initiated by a server application acting on behalf of the user. Workstation may also not be filled in for some Kerberos logons since the Kerberos protocol doesn't really care about the computer account in the case of user logons and therefore lacks any field for carrying workstation name in the ticket request message. Source Network Address: The IP address of the computer where the user is physically present in most cases unless this logon was initiated by a server application acting on behalf of the user. If this logon is initiated locally the IP address will sometimes be 127.0.0.1 instead of the local computer's actual IP address. This field is also blank sometimes because Microsoft says "Not every code path in Windows Server 2003 is instrumented for IP address, so it's not always filled out." Source Port: Identifies the source TCP port of the logon request which seems useless since with most protocols' source ports are random. Package name: If this logon was authenticated via the NTLM protocol (instead of Kerberos for instance) this field tells you which version of NTLM was used. See security option "Network security: LAN Manager authentication level"
Transited services indicate which intermediate services have participated in this logon request.